All concrete work is now complete. 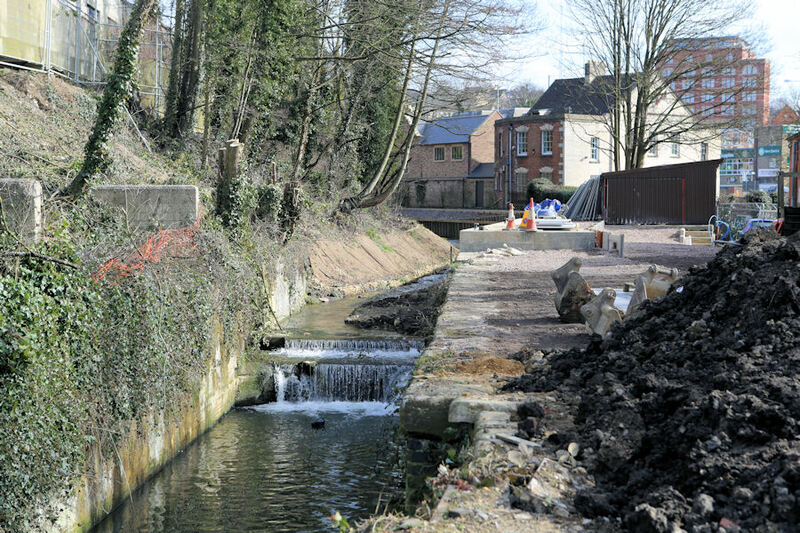 The contractors have completed the fish pass – eel matting, access ladders to the resting pools, inlet/outlet grilles etc. The Alun Griffiths of Abergavenny team left site on Monday 10th March. Cheltenham based Britannia Construction will be the next contractors on site. Britannia will restore the lock chamber and are due to commence this work in May. Britannia will also carry put some minor finishing work to the towpath when the lock is complete. That work has had to wait as access remains limited for the restoration of the lock chamber. Over 200 fish had to be relocated from the water above the lock to the canal at Lodgemore. Himalayan Balsam and the particularly dangerous Giant Hogweed were present on and near the site. The site was challenging as it was a long narrow place to get plant and materials in and out. Having dealt with the dangerous greenery the Griffiths team surveyed the alignment of the works to seek out some electricity cables. 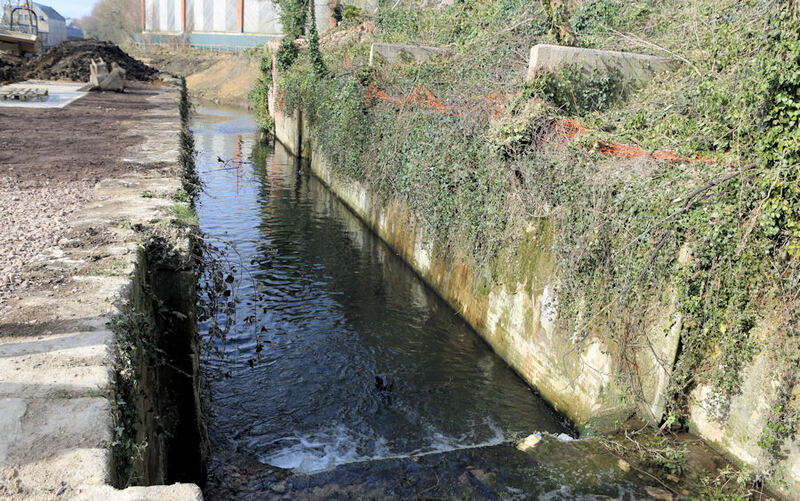 The navigation channel above the lock was widened and deepened to 5 metres wide x 1.2 metres deep. 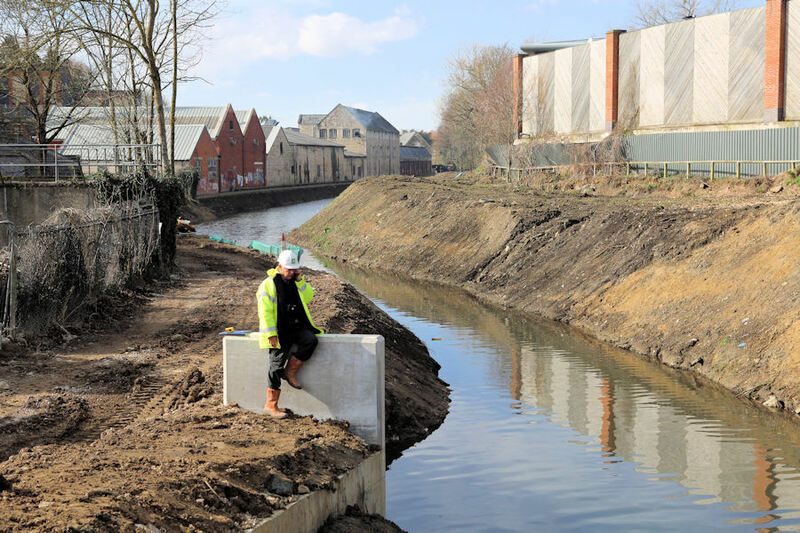 Local company Cotswold Formwork Ltd. (CFL) constructed the formwork and installed 17 tonnes of reinforcing steel to create the 75 metre long concrete channels and chambers running beside the lock chamber. Local firm Moreton C. Cullimore supplied 175 cubic metres of concrete. "It certainly was challenging! It is a narrow place to get a lot of machinery and kit in and a lot of material out before the form work could be installed and concrete poured. We had to deal with some winter weather of course but the job was done." Asked to comment on the involvement of local companies Kevin praised Cotswold Formwork. "They didn’t have far to come mind you! They just took down the fence in their yard beside the lock but they worked well to get it all ready for the concrete. Cullimores have a base near Stroud and they were always on time with the right quantities of ready mix." 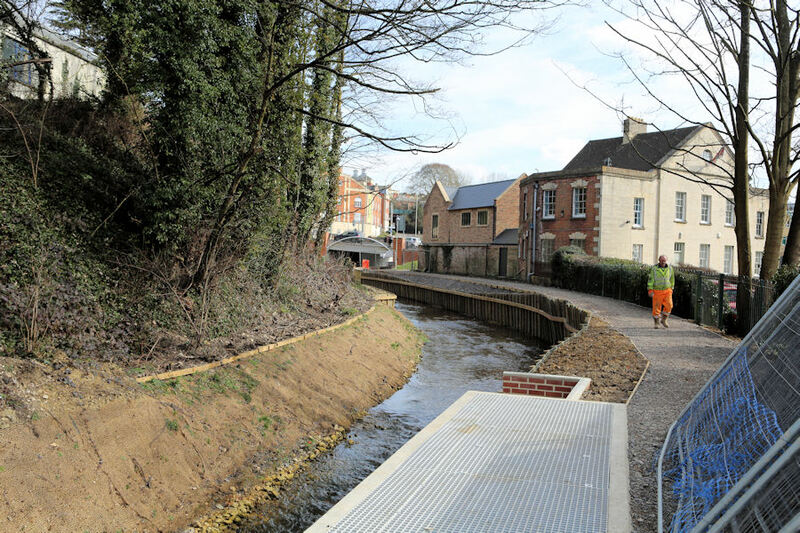 Stroud District Council’s Canal Project Manager Dave Marshall endorsed Kevin's views and added… "Progress is being made and we look forward to seeing the Britannia Construction Team back with us. It was Britannia that constructed Upper Mills Bridge in Stonehouse. The towpath cannot be opened until their work is complete as they need to get machinery into the same narrow area"